Opportunity!! New reduction to 550.000?. Fabulous traditional family residence, also ideal for Bed & Breakfast. A Charming Rustic Traditional Finca located within walking distance to all the amenities of Cartama Village! 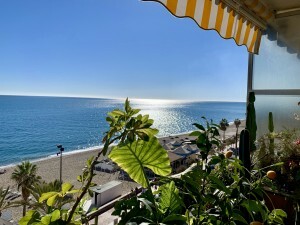 Beautiful main pool area with privacy and tranquility surrounded by sunny terraces and large covered chill out area. The raised terrace features a fully equipped summer kitchen area with all day sun and is large enough for several tables for dining overlooking the pool and countryside. At the rear of the dwelling there is a further driveway with ample parking and two garages. The house has its main entrance via a large covered terrace with dining table, barbecue and various seating areas adjacent to the second pool and the Jacuzzi. Entrance hall, large living room with fireplace and dining area next to the fully and well equipped professional kitchen, plus 2 double bedrooms. Upstairs is the master bedroom with bathroom. The guest area (with independent access and with interior access to the rest of the house) is distributed as a living room with fireplace and access to a beautiful, private courtyard. There are three beautiful bedrooms, all en suite with lots of character, plus an additional guest bathroom. The property is in perfect condition throughout with air conditioning in all bedrooms, living rooms and the bathrooms have heating. There are solar panels providing the hot water. The plot is fully fenced with mature fruit trees and there is a well maintained terraced garden with automatic irrigation system throughout. 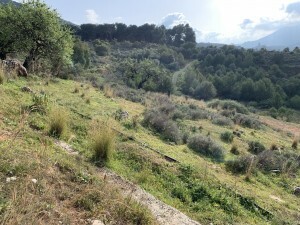 There is town water and the Finca has two wells on the plot of 3´500m2. Plot 3.500m2. Total built size 397m2. Living area 299m2. Warehouse 49m2. Porch 49m2. 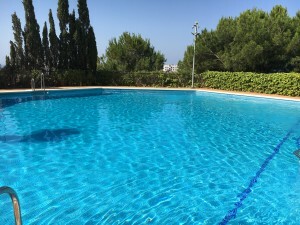 Main pool 33m2 and another with 17m2. Amenities (bars, restaurants, shops) 400 meters.